Hidden Meadow Inn is located in Norfolk, NY in the St. Lawrence River Valley. Convenient to Clarkson University, St. Lawrence University, SUNY Canton, and SUNY Potsdam, the Adirondacks, Canada, the St. Lawrence Seaway and a wealth of local attractions. Open year-round, the inn serves a full Shaker-style hot breakfast. To our knowledge, we are the only North Country lodging provider that features the super-comfortable Swedish TempurPedic® Queen Beds. 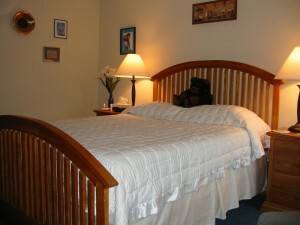 Guests often comment what a pleasure it is to sleep as well as or better here than they do at home. Guests from around the world to our 20-acre estate enjoy the gardens, spectacular sunsets from the front porch, lawn sports, out-the-door hiking (accompanied by our fun-loving keeshonden dogs if desired), bird-watching, cross-country skiing and snowshoeing on groomed trails through woods and meadows with easy river access. For families with small children, we have three Graco Pack ‘n Play® units that can be set up indoors or out in good weather (one less piece of baggage to check! ), a high chair, baby bath, changing pad and diaper pail. We also make homemade, sugar-free applesauce for the little ones. We can sometimes make this large room available for those who need to be on the first floor. Please let us know if that is a priority for you. 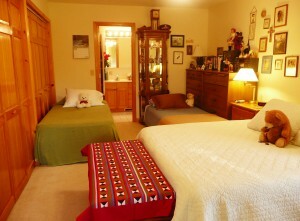 Visit our B&B Blog for guest reviews and innkeeper journal entries such as this one. If we do anything to make you unhappy, please tell us. If we do anything to make you happy, please tell others. 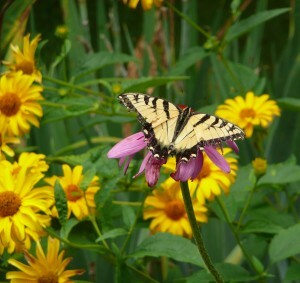 We just returned from our very comfortable stay at Hidden Meadow. Joanna and Bill allow us to feel like their home is our home. What a great relaxing weekend we had at Hidden Meadow Inn. It is the best bed and breakfast I’ve been to. 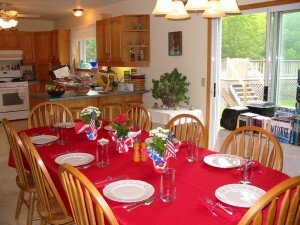 The breakfast’s were soooo good and the room – we had the Alaska Room – is very comfortable. Nice walking trail also. There are many great sights to see and a trip to Canada is easy. If you haven’t been to Hidden Meadow Inn put it on your list of “must do”. My family had the dreaded task of dropping our son of to college ,and found the most beautiful B &B in the world,we found the most wonderful couple Joanna and Bill you made this experience so delightful.May GOD continue to bless you that you can continue to be a blessing to others as you were to us. Absolutely wonderful B&B. Bill and Joanna are very gracious hosts. We have stayed with them twice and look forward to the next of many visits while our son attends Clarkson. We just visited the second time at this beautiful B&B in Norfolk, NY, north of Potsdam and east of Canton, and it was wonderful. Our son is a St. Lawrence freshman this year and on our visits to the area, we wanted to stay in a small local place and found Bill & Joanna’s home where they welcome their guests with a warmth and all the comforts of home that can never be had in those chain hotels. Breakfast is fresh and custom-made at the guest’s request, with lots of scrumptious choices, the rooms are spacious, immaculate and comfortable. We’ve learned a lot about the local community while meeting interesting new people as we share breakfast together. Their two Keeshonden dogs, Apache and Lola, are the most well behaved and friendly we’ve met, and their beautiful coats will keep you warm when they sit by your feet in front of the fire place on those chilly winter days. Our younger son really enjoyed their company. 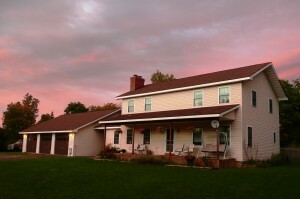 If you are looking for a peaceful place to stay in the North Country, this is it. We definitely plan to visit again and explore the rest of the inn. We needed a place to stay at the last minute and found the Inn on our GPS. We were warmly welcomed and provided the most comfortable lodgings. It was beautifully quiet when we wanted quiet and had lots to do when we wanted activities. The breakfast was a feast for the palate and for the eye! Bill and Joanna made the stay even warmer with their personalities and gift of hospitality. We look forward to coming again! We stayed with Bill and Joanna at the Hidden Meadow Inn when we dropped our freshman off at Clarkson University in August, and we are very much looking forward to staying with them again when we return for Family Weekend! They are the most gracious hosts we’ve met in our travels; truly sharing their home with us. The rooms are spotlessly clean and very comfortable; there are ample towels, blankets and anything else you might need available; Bill and Joanna are knowledgeable about the area and are very helpful with recommendations on sites to see, things to do, and places to eat; and their breakfasts are absolutely delicious! We plan to stay with them many times over the next few years and highly recommend the Hidden Meadow Inn to anyone visiting the area for any reason!